Warriors advance to face Brighton of Section V in state semifinal on Saturday. Amityville continued its campaign of shock and awe on Sunday. 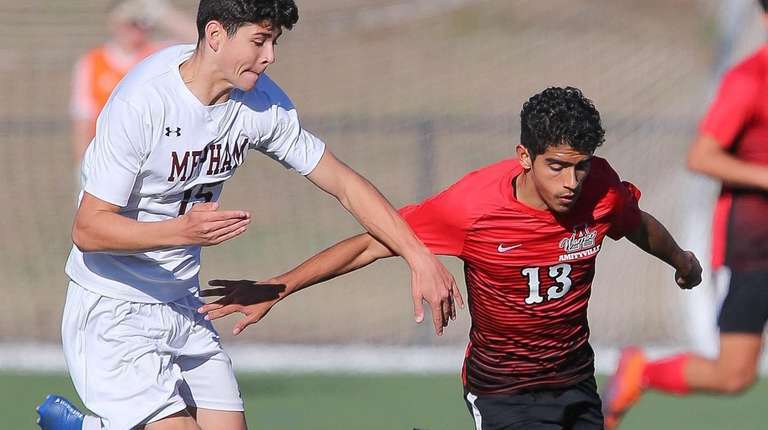 The Warriors scored five first-half goals in a 5-0 win over Mepham in the Long Island Class A boys soccer championship game at Diamond in the Pines in Coram. They have won three of the last four Long Island finals. Amityville (20-0-1) will face Brighton (17-4) of Section V in a state Class A semifinal at 9:15 a.m. Saturday at Middletown High School. Amityville scored its first three goals in an 11-minute span. Kymani Hines put a move on a defender, leaving him seated on the pitch, and found Henry Martinez for a undefended shot and goal with 33:09 left in the half. Hines did it all himself with some brilliant one-on-one moves and put in a left-footed shot on the left side with 28:24 left. Guardado scored his first goal with 22:12 remaining. Out on a breakaway, he seemed to lose control briefly but recovered and scored into the top of the goal. Angel Zavala scored nine minutes later and Guardado got his second goal with 10:45 left before the break. Mepham (15-2-1) was more aggressive in the second half with nine shots at the goal, but keeper Kyle Barsic was able to make saves on the three that were right on target, two by Connor Buehler. Amityville won the state public school title in 2015 and a number of current Warriors played on that team. Guardado and Carlos Ponce seemed especially eager to get one more taste of that glory.